For the past seven and a half years, Father Eric Johnson worked hard to promote vocations to the priesthood and religious life in central and southern Indiana. As seminarian Danny Bedel tells it, not even a tornado could stop him from helping men hear God’s call. Father Johnson was scheduled to meet Bedel, a high school senior at the time, and his family in their rural Decatur County home to talk with them about Bedel enrolling at Bishop Simon Bruté College Seminary in Indianapolis. Father Johnson showed up nearly an hour late. In that dedicated ministry, Father Johnson was given the chance to meditate often on his own priestly call. Earlier this month, Father Johnson’s tenure as archdiocesan vocations director came to an end as he became administrator of Our Lady of Perpetual Help Parish in New Albany. At the same time, his predecessor as the leader of that faith community, Father Eric Augenstein, began his ministry as the archdiocese’s new vocations director. As Father Augenstein begins his ministry in promoting priestly and religious vocations in the archdiocese, he hopes to emulate Father Johnson’s ministry in that position in a particular way. “I especially appreciate his ability to form and nurture relationships and to be attentive to individual people as they’re discerning God’s call and working through the formation process,” Father Augenstein said. For his part, Father Johnson sees his successor bringing his own gifts and talents to this important ministry. Bedel, in his third year of priestly formation at Saint Meinrad Seminary and School of Theology in St. Meinrad, continued to see the commitment that Father Johnson showed in his first meeting with him six and a half years ago. Father Johnson has also been a role model for Bedel for how to live out the call to the priesthood. As vocations director, Father Johnson has seen many men enter the priesthood. 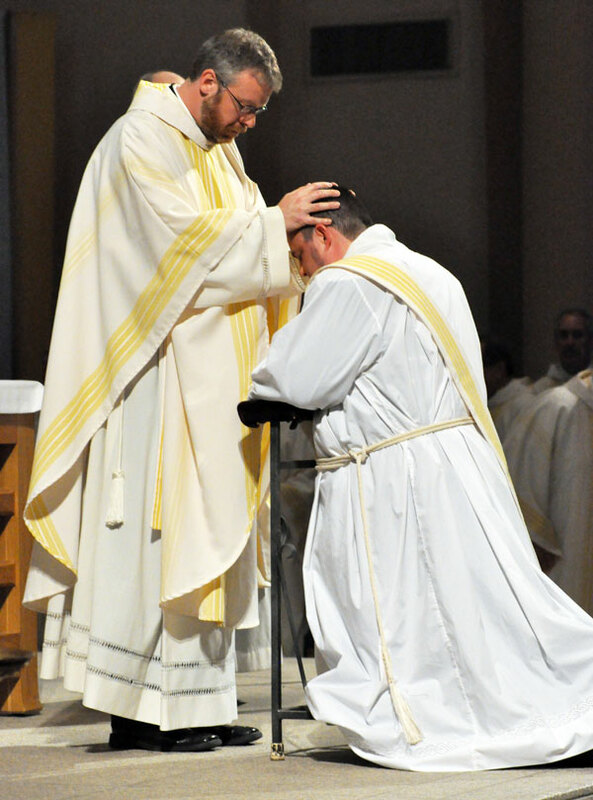 Each ordination has been a fulfilling moment for him.